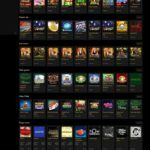 Black Diamond Casino is an online casino including mobile, bingo and live dealer games, established in 2009 using games powered by multiple software providers. It is operated by Engage Entertainment Group and is licensed under the jurisdiction of Curacao. The welcome bonus gives you 25 free spins as a no deposit sign-up bonus and 500% free cash bonus on your first 5 deposits. The daily bonus gives you free cash each day for a certain amount of deposit required. The biggest rewards are on Saturday, which is 300% cash for $500 and more and 350% cash for a deposit that is $1000 minimum. These guys know that first impression is important, and they encourage new players on their first deposit. Newbies will be surprised to find a free chip added into their account as a bonus. After this first incentive, you got to play a game free of charge. Now the next 4 deposits you make will also receive an excellent bonus. The moment he applied, the new player became a member of the Sapphire lounge, with VIP status. You will play more and more and unlock further levels like the Ruby Lounge, Black lounge the best of em’ all the Black Lounge. The perks of being a VIP member include the fact that for each wager as small as 1$ the player receives 1 comp point. What these comp points do is offer a physical and mental incentive to continue playing. It gives players a feeling of progress and reward for loyalty. And every 1000 of these points are redeemable for 1 $ of real cash. The points can be withdrawn whenever the user wishes. For all those with a preference in slots, Black Diamond Casino has much to offer. Their uniqueness has to do with the fact that there are as much conventional three-reel games as there are bonus video slots. There are a lot of things for you to do including free spins and games like “Reel Gangsters”, “Forest Treasure” and “Mad Orchestra”. There are also more classic slots like “Crazy Pizza”, “Berry Flavors” even “Diamonds Are Forever”. Furthermore, both European Roulette and Roulette Crystal, are something you can find at Black Diamond Casino together with more than one versions of single hand as well as multi-hand blackjack games. You can entertain yourself by trying the 4 video poker variations: “Jacks or Better”, “Deuces Wild”, “Joker Poker”, and “Deuces and Joker” as well as games like baccarat, war, keno and “Weed Whacker”. The customer support team at Black Diamond Casino is very organized. Every casino member can use the live support system found in the online casino site or at their personal account. Other choices are the free phone number for residents of both the US and UK, as well as the utilization of the special international phone number for everybody else. For those that prefer e-mail contact, however, Black Diamond Casino has also a system of customer support that operates in this way. Black Diamond Casino has made significant efforts to provide to its members the level of safety they look for. The moment you become a member, every piece of info you provide the casino with is to be protected by use of SSL encryption in spite of the origin or the sensitivity of that piece of information. All kind of transactions are of course very much safe for the casino has utilized a very secure payment gateway for this purpose alone. The Black Diamond Casino uses a Top Game software which is tested periodically to ensure the fairness of the games. TST is being chosen as the exterior auditing company in charge of making all necessary tests to make sure all fairness regulations are obliged. Their seal to prove this procedure can be recognized at the Black Diamond Casino’s website even though the actual report is not in the members’ disposal for review. Update: RedRake Gaming is now available for AU and FR Players (only) at Black Diamond. The games can be played with real money only. There are currently 5 Games available.